CCGB approved breeder .cockapoo club of great Britain..edwards cockapoos. 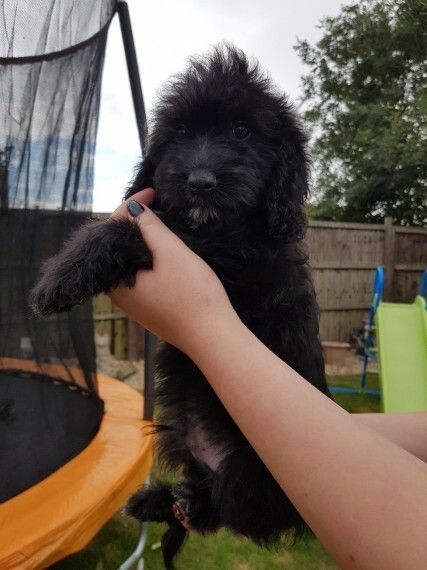 we pleased to advertise our f1 cockapoo babies now they are ready to leave after having both vaccinations. we have .1 black and white girl.1 blue roan boy. 1 black and white boy.1 black boy. 2 black girls and one black and tan boy looking for homes. .Black and white girl is now reserved. Black boy.595 Black girls.595 Black and white girl .950 ..sold Black and white boy.750 Blue roan boy.750 Black and tan boy .750 mum is daisy our show type cocker spaniel .kc reg. and clear of pra fn and ams. dad is cooper our chocolate miniature poodle .kc reg. clear of pra and fn. both daisy and cooper are super friendly. playful and pleased to meet everyone. they are brilliant with our little boy and are both with us for everyone to meet when coming to see their babies. our puppies have had both vaccinations and are now ready to leave for their new homes. they have been wormed every 2 weeks from the age of 2 weeks old. they will leave us with . first and second vaccinations vaccination card. microchip. 4 weeks free insurance. puppy pack and folder. which will include copies of mum and dad kc paperwork. their own 5 gen pedigree. puppy guide. grooming advice. rspca puppy contract.food to last 2 weeks.toy smelly blanket and bowl. they are fully weaned and eating solid food. they are used to other dogs they play outside with mum and dad not just mum. they are around our little boy. all our house hold noises. they were born in our house and live in our house. We have done the most we can to introduce them to life in the big wide world from exploring our garden . visiting diffrent family members . car jorneys ..we try to take one puppy each day out with us they are used to being on there own in the car and out of their surrounding area brothers and sisters. they are very lively and playful. they are not nervous puppies and always have waggy tails. dad is 13 1.2 inches to the shoulder and daisy is 16 inches to the shoulder so we expect our puppies to grow between 14.15 inches when fully grown. emails calls texts welcome. visiting welcome anytime.